Jun. 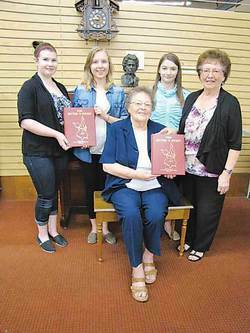 7, 2013 5:00 a.m.
Left: Elsie Baker, seated in front, is proud to present copies of “The Bitter 'N Sweet” to Wetaskiwin Public Library representatives Mackenzie Jordan, Libby Hildebrand, and Christine Hutchinson, and to Wetaskiwin & District Heritage Museum CEO Sylvia Larson. Elsie Baker was also very proud to present copies to the Wetaskiwin Public Library and to the Wetaskiwin & District Heritage Museum. She is one of several people who cared enough and lived long enough to work on both history books. Helping these old timers were the sons and daughters (with their spouses) of families involved in producing the first book. The Bitter 'N Sweet II contains one major change from Book I—it has colour pictures. It updates the history for the same school districts around Bittern Lake and Sifton as were in the first book. Costs for publishing the book have also increased in the past 30 years. During the 1970s and 1980s, history books were compiled and published for nearly every small community and rural area, generally based upon the original school districts. Thirty or more years have passed, a generation has passed on, and there have been many changes. Is it time for other communities to follow the example of Bittern Lake and compile updated histories of their areas?